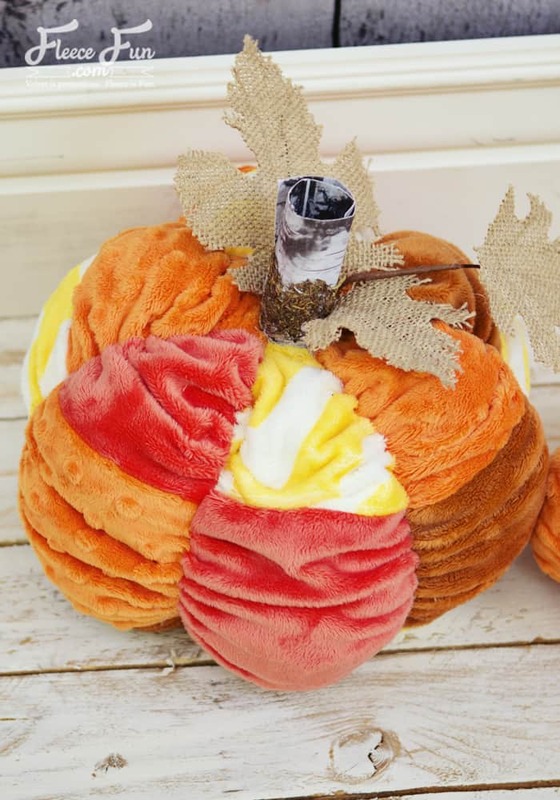 This cute pumpkin goes perfectly with last year’s Scrunched Pumpkin Pattern. 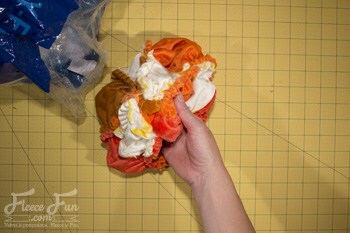 This patchwork pumpkin tutorial is cute soft fun and best of all – if you have little kiddos it’s hard to destroy. ( it’s been tested by my 2 year old). 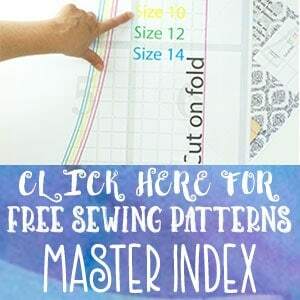 Print up and cut out pattern pieces. 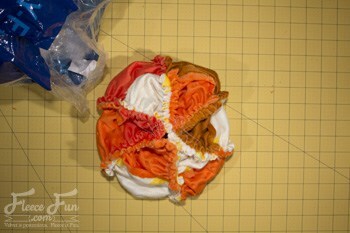 In the pattern example I used 4 different fabrics, a minimum of 3 is suggested. Cut 6 of each pattern pieces 1, 2, and 3 from different fabrics. You will make a total. Note that wedge of the pumpkin is not symmetrical – be sure to mark the top with a pin. 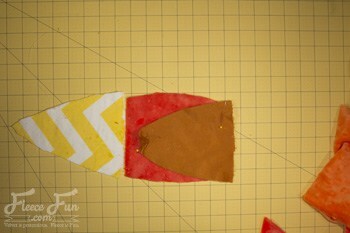 Layout each wedge, alternating the fabrics in a pleasing manner. 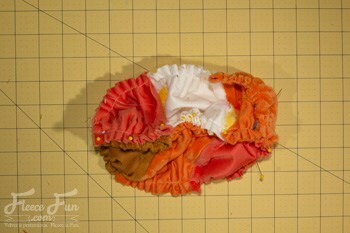 Then using a half in seam allowance sew pieces 1 to 2 and 2 to 3 to form a wedge. Continue until you have made all 6 wedges. Step 3 – Ruche the wedges. 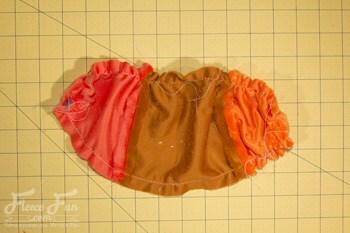 To give the fabric pumpkin that nice ribbed look, we’re going to ruche the sides of each wedge. 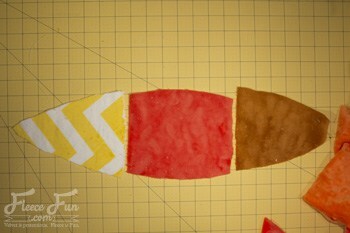 Sew a basting stitch along each side of the wedge, then gather. Repeat on all wedges. 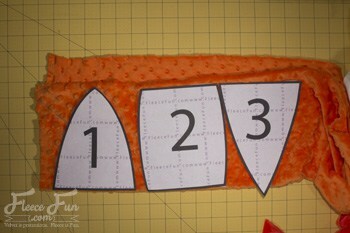 Note: Be sure to leave a pin at the top of each wedge to you know which is the top (piece 1). 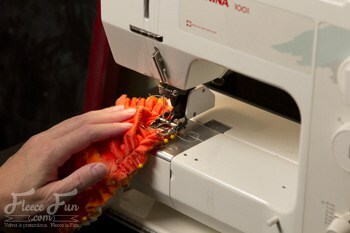 Pin and sew the wedges together, using a half inch seam allowance. Be sure to pin the tops ( the end marked with a pin) together. 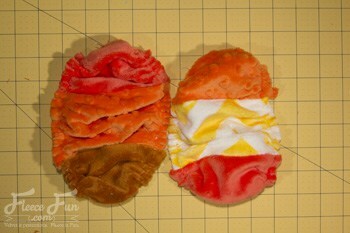 Pin along the side and sew. Continue to build the pumpkin all the way around. 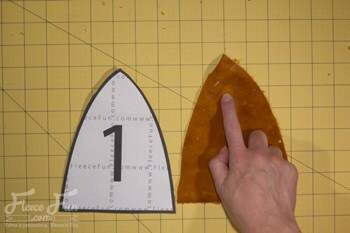 When you sew the last wedge to the first wedge, leave a 2 to three inch gap at the top for turning. Turn pumpkin right side out. Stuff to desired firmness. 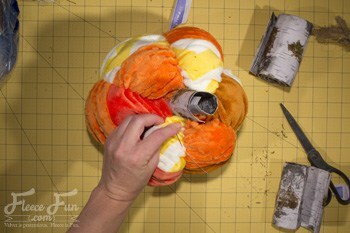 place stem in the top and hand stitch the gap shut and secure the stem. 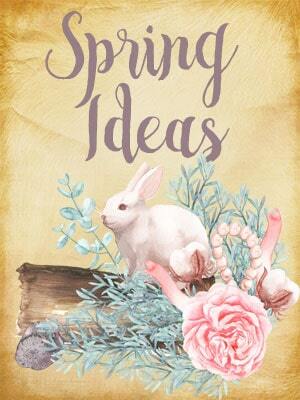 Add leaves if desired. Help! I keep trying to subscribe, but no confirmation email comes to my box! I don’t know if it’s the new Windows 10 or some other problem??? Hmm have checked your spam folder? Sorry for the trouble. If it isn’t in your spam folder email me.